In the electric power, metallurgy, chemical industry, mining, cement, paper-making and other industries, because the conveying medium for conveying equipment wear-resistant requirements are relatively high, ordinary steel pipe cannot meet the actual use needs, which requires better wear-resistant conveying equipment. 6. After installing the ceramic ring, check the internal surface of the ceramic ring of the formation, finishing in place, cannot move the position of the pipe, because the binder is not dry, vibration is easily caused by the displacement of ceramic rings, affect the use of the effect of cold weather in winter, binder drying time is longer, need to ensure more than 48 hours. After the ceramic ring in the pipe is installed and the thread is processed, the dirt outside the pipe is cleaned, and the outer surface of the pipe is treated with three layers of anticorrosive paint to meet the export requirements. 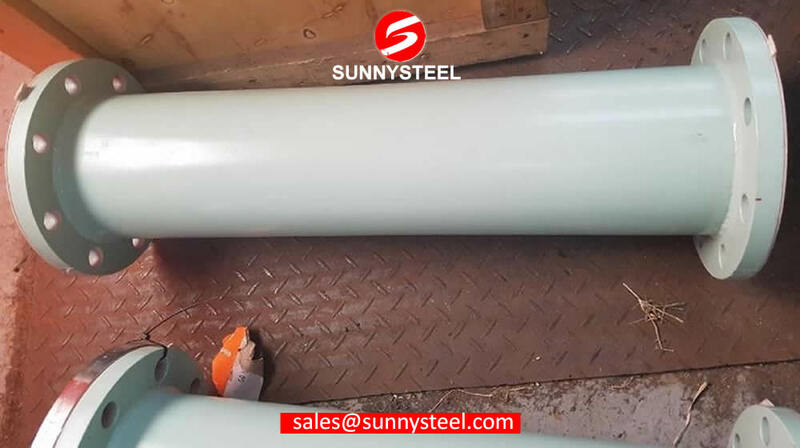 Abrasion resistant pipe using steel skeleton packaging, and the two ends of the pipe with plastic head, to prevent dust and rain into the pipeline inside, to ensure the beauty of the product. 1. The wear-resistant ceramic ring has the characteristics of smooth interior wall and super wear resistance. Widely used in chemical, fine powder conveying pipelines and other industries, with high wear-resistant and anti-corrosion functions. 2. In accordance with the traditional process, the production of wear-resistant ceramic ring is mainly the use of hot-pressing casting or grouting molding. Adopting isostatic pressing forming technology, the ceramic ring with isostatic pressing is better in compactness and more accurate in ceramic size. 3. At present, our ceramic ring lining pipeline in the silicone industry, chemical industry, fine powder conveying industry has been widely used. We use the Australian Megapoxy high strength structural adhesive, this structural glue is modified epoxy resin polymer, anti-aging ability, and wear-resistant ceramic bonding to form a strong and cushion of the anti-wear layer, cured water, anti-corrosion performance is excellent, toughness, displacement-resistant effect is remarkable.